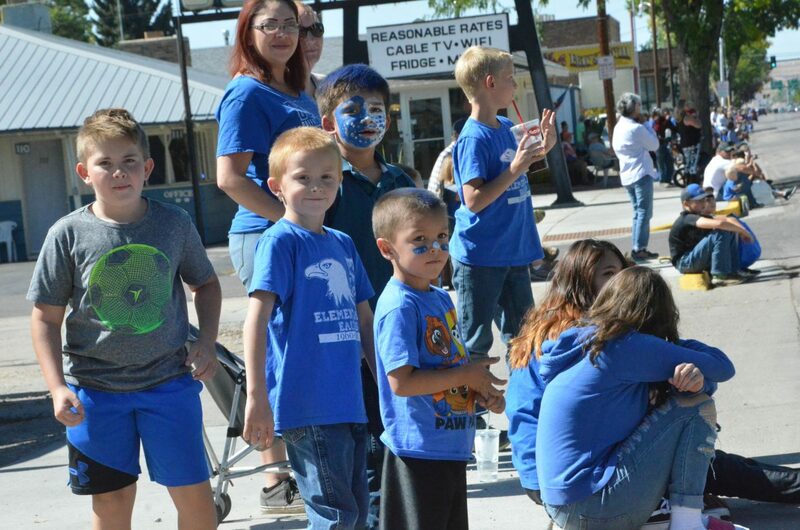 Spectators of all ages enjoy the Moffat County High School Homecoming parade. 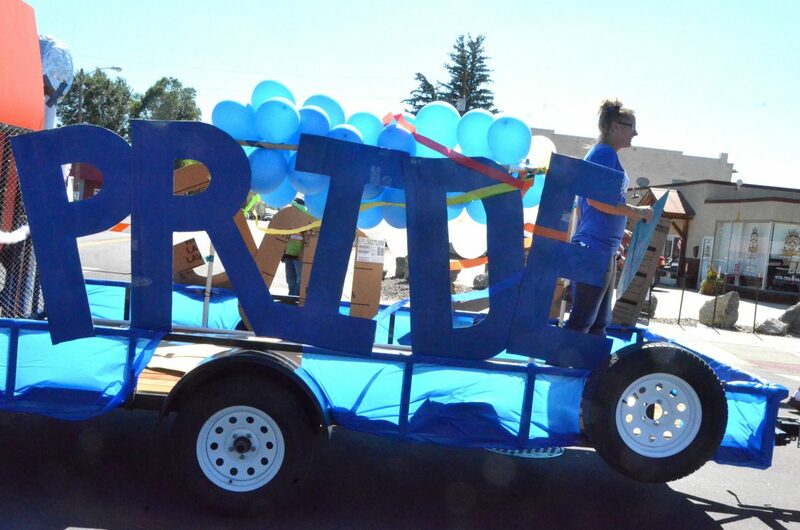 Moffat County High School seniors display their upperclassmen pride during the Homecoming parade Friday. 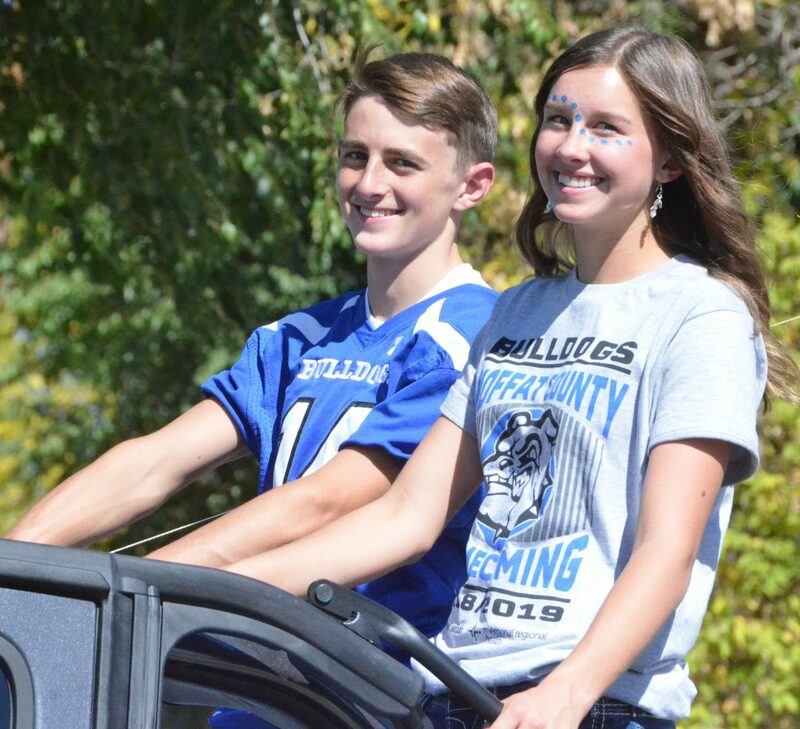 Moffat County High School's Jared Atkin and Quinn Pinnt are the 2018 king and queen during the Homecoming parade Friday. 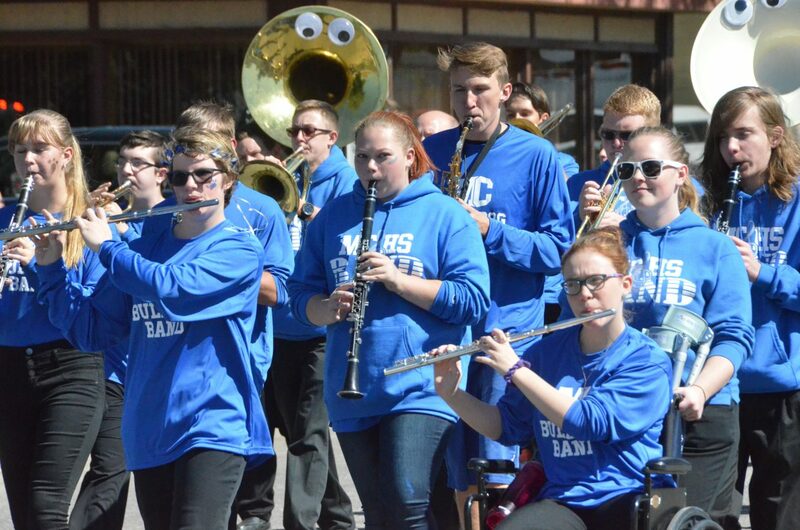 The Moffat County High School band performs Michael Jackson's "Beat It" as they move along Victory Way in the Homecoming parade Friday. 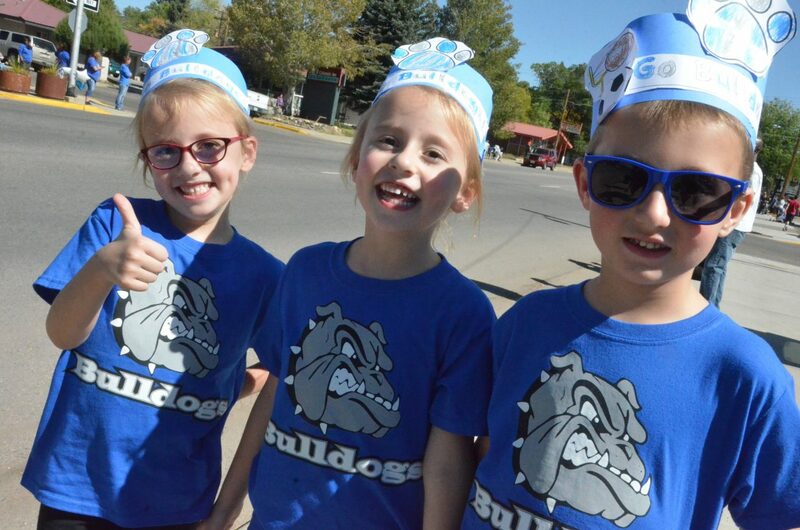 Triplets Grace, Peyton and Jack Sondrol, 5, show triple the Bulldog pride at the Moffat County High School Homecoming parade Friday. 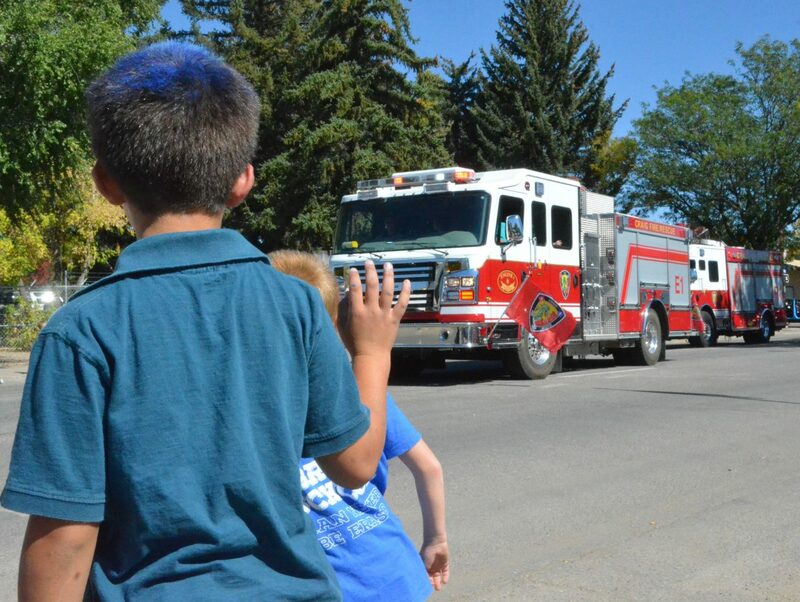 Young spectators wave to firefighters in the Moffat County High School Homecoming parade Friday. 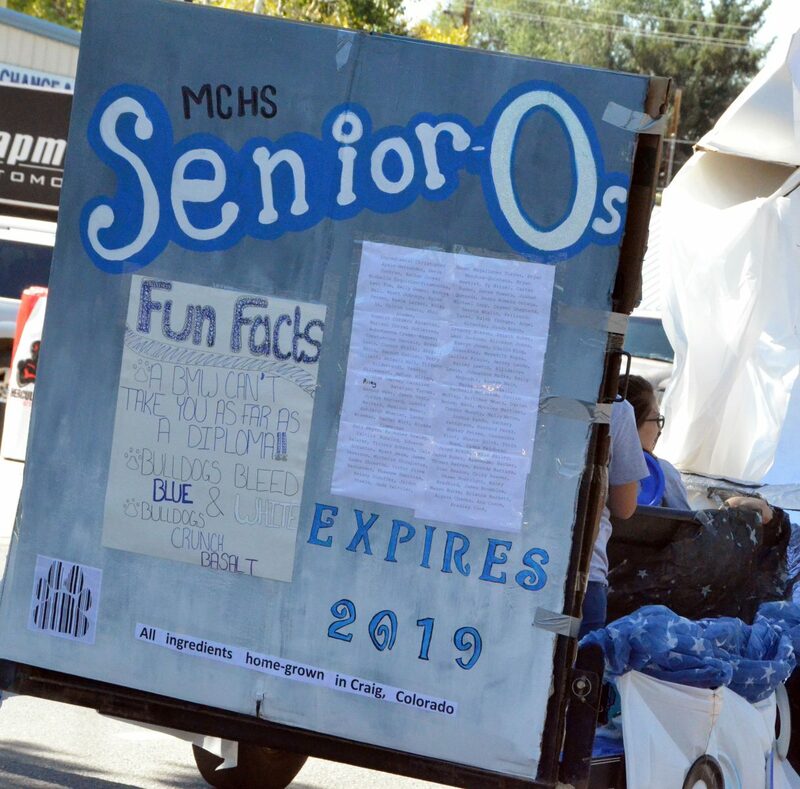 The rear of Moffat County High School's senior class float displays nutritional facts during the Homecoming parade Friday. 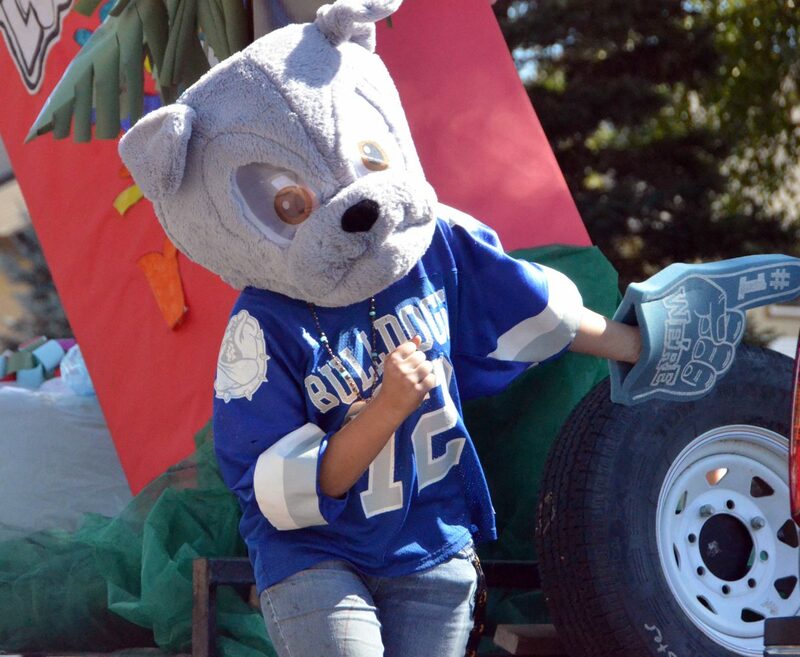 One of many Bulldog mascots marches in the Moffat County High School Homecoming parade Friday. 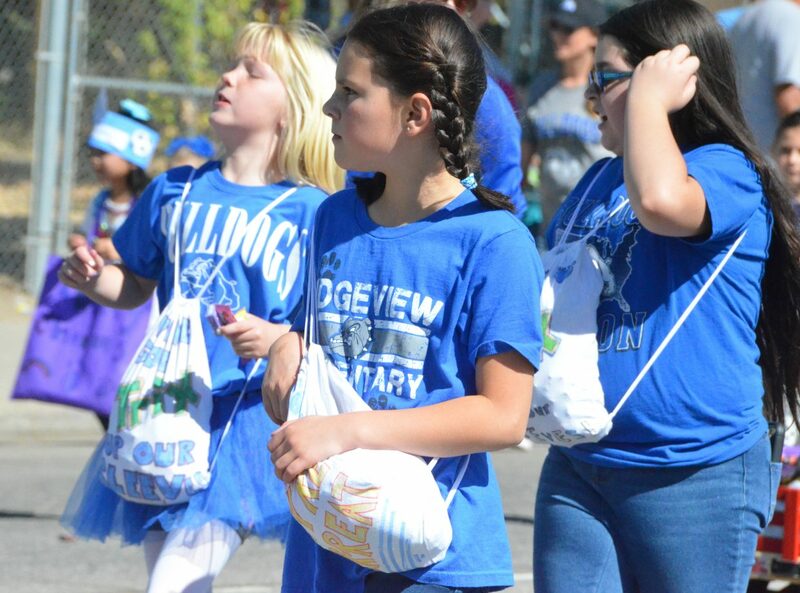 Ridgeview Elementary School students look for crowd members seeking candy during the Moffat County High School Homecoming parade Friday. 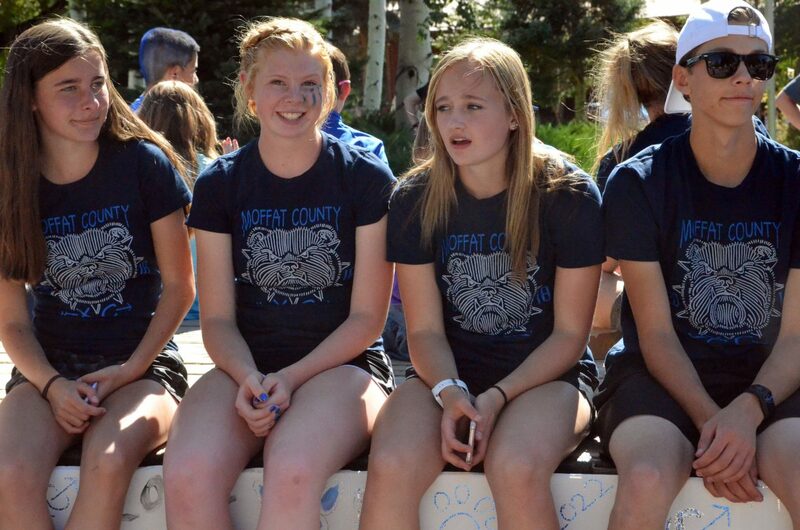 Moffat County High School cross country runners stay off their feet during the Homecoming parade Friday in preparation for Saturday's home meet. 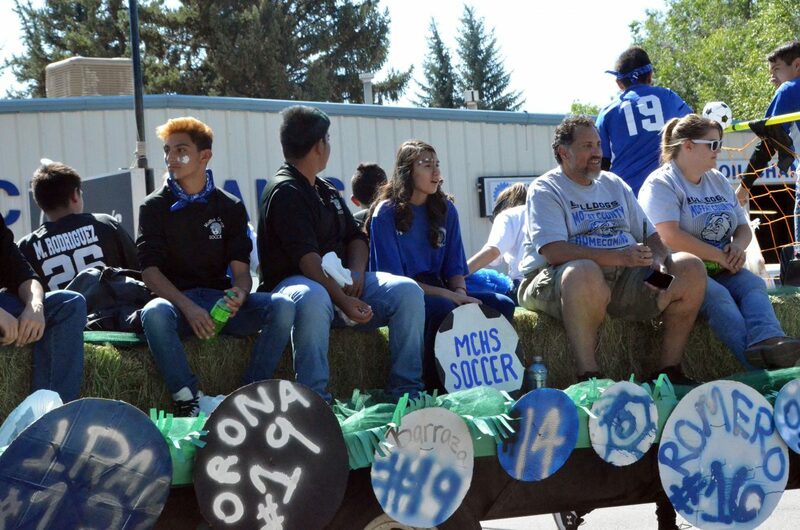 The Moffat County High School soccer team rides on their float during the Homecoming parade Friday. 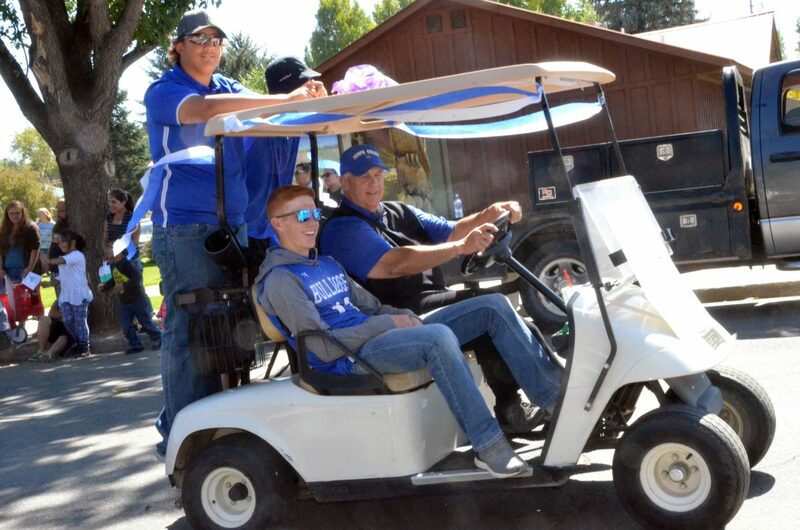 Moffat County High School golfer and state qualifier Torin Reed joins teammates during the Homecoming parade Friday. 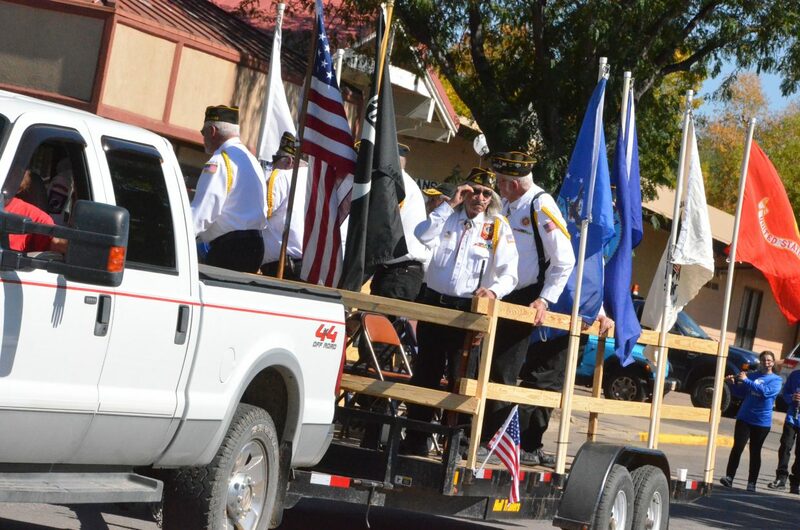 Craig veterans are the first in line during the Moffat County High School Homecoming parade Friday. 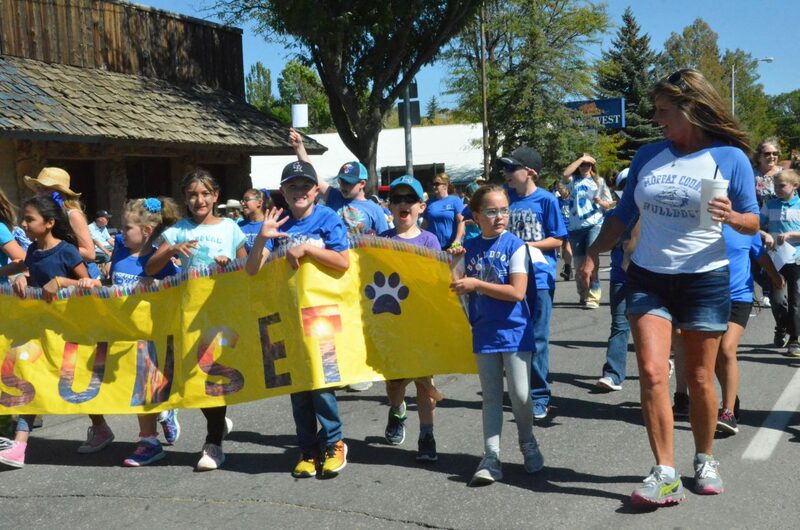 Sunset Elementary School's Peggy Green marches alongside students during the Moffat County High School Homecoming parade Friday. 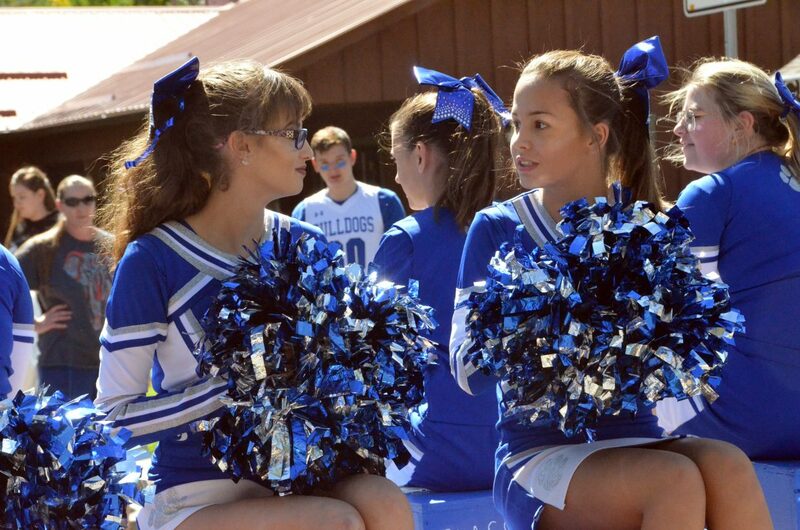 Moffat County High School cheerleaders chat during the Homecoming parade Friday. 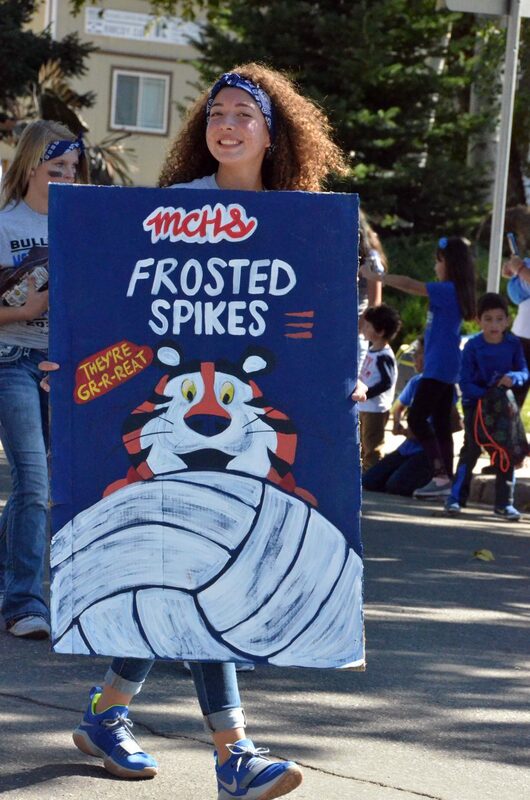 Moffat County High School's Olivia Profumo marches with a Frosted Flakes sign for the Bulldog volleyball team during the Homecoming parade Friday. 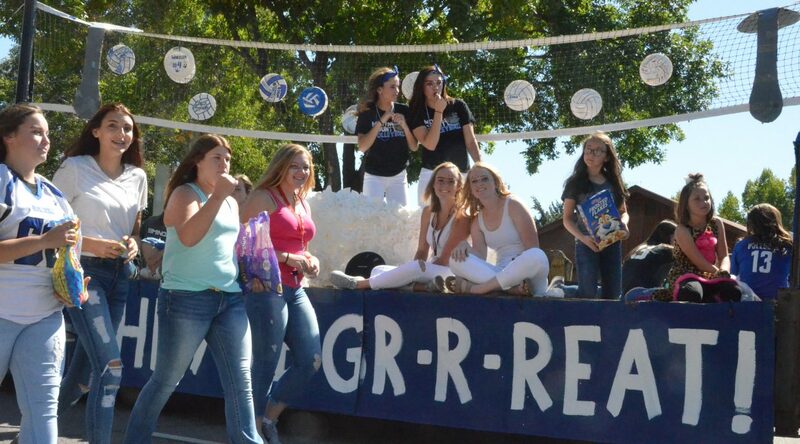 The Moffat County High School sophomore class has a heaping helping of Froot Loops ready during the Homecoming parade Friday. 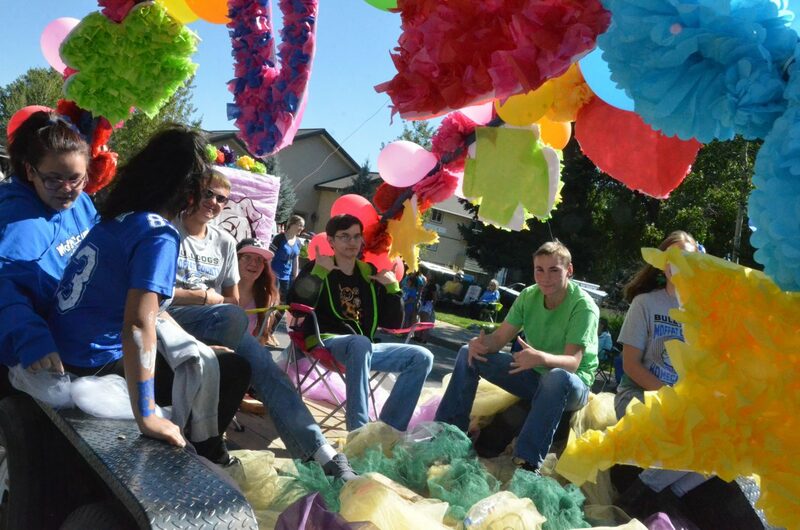 A splash of color decorates the junior class float during the Moffat County High School Homecoming parade Friday. 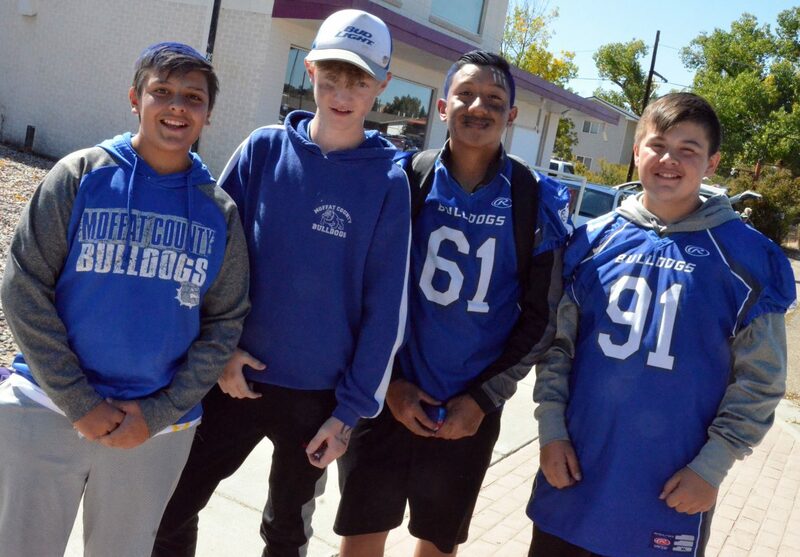 Craig Middle School students wear plenty of blue and white and other Bulldog gear during Moffat County High School's Friday Homecoming parade. 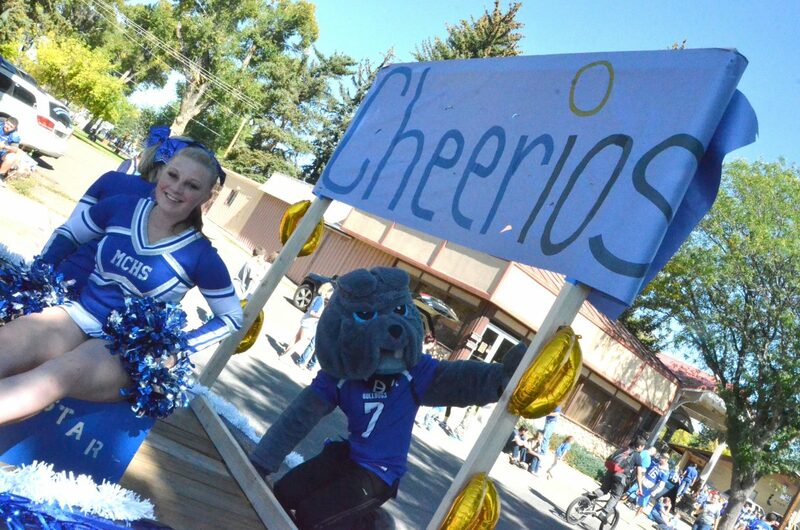 The Moffat County High School cheerleaders and mascot wave from the Cheerios float during the Homecoming parade Friday. 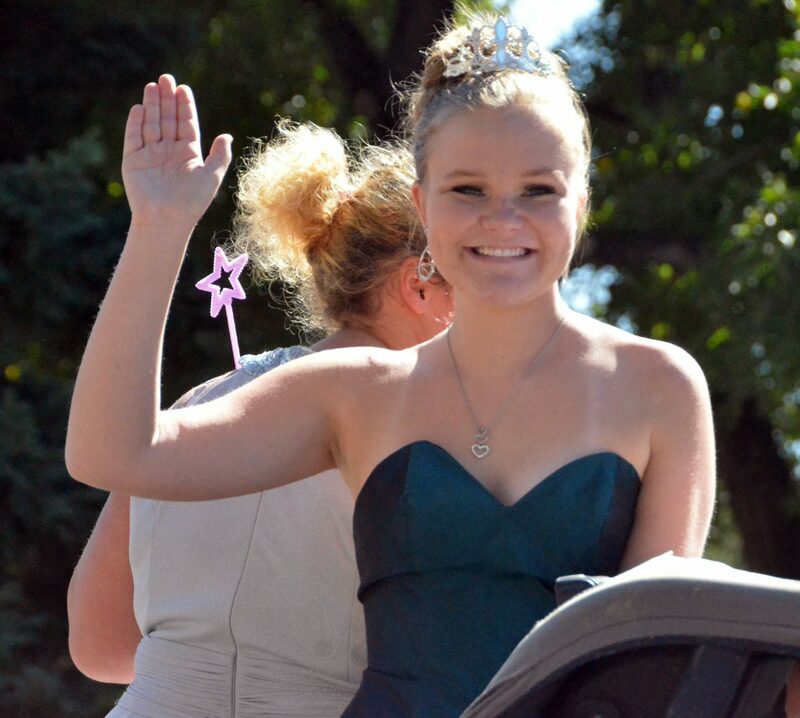 Moffat County High School's Caroline Riley waves to the crowd dressed as Cinderella to promote MCHS theater's upcoming musical during the Homecoming parade Friday. 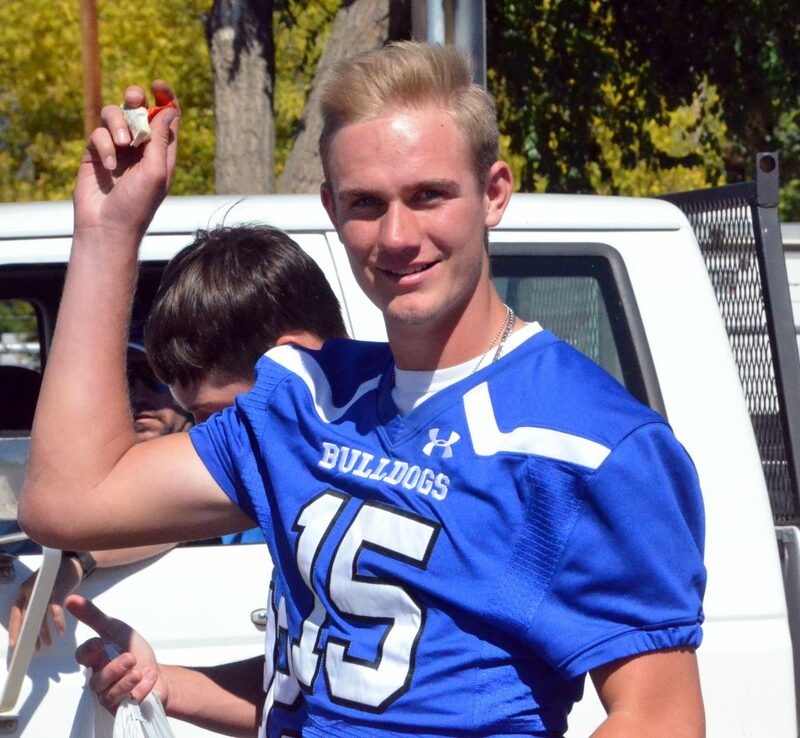 Moffat County High School quarterback Colby Beaver lines up to pass some candy to the crowd during the Homecoming parade Friday. 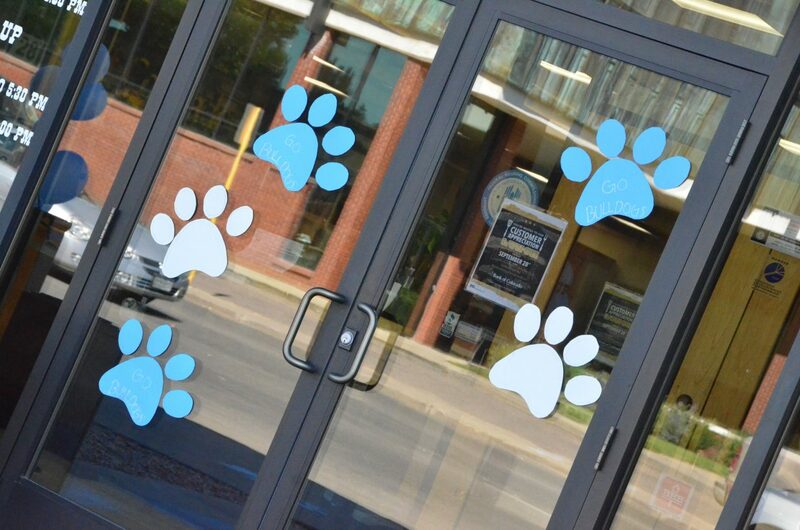 Bank of Colorado is heavily decorated in blue and white during Moffat County High School's Friday Homecoming parade. 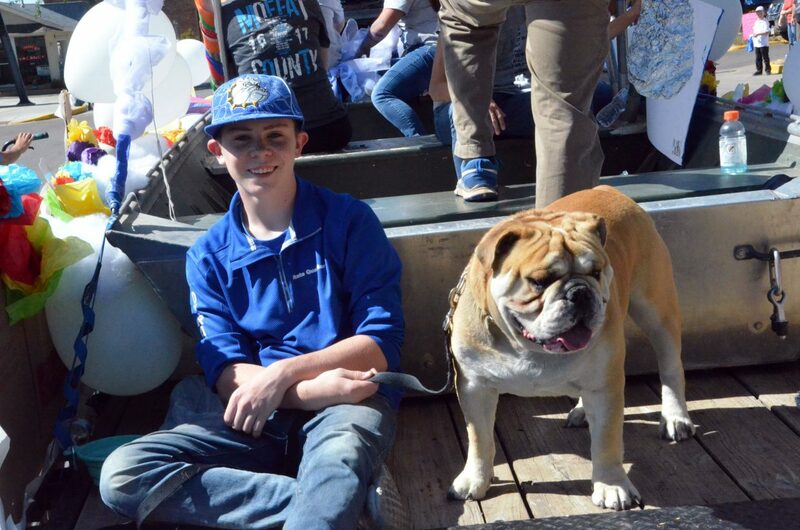 Bulldog pride isn't limited to just one breed of canine during Moffat County High School's Friday Homecoming parade. 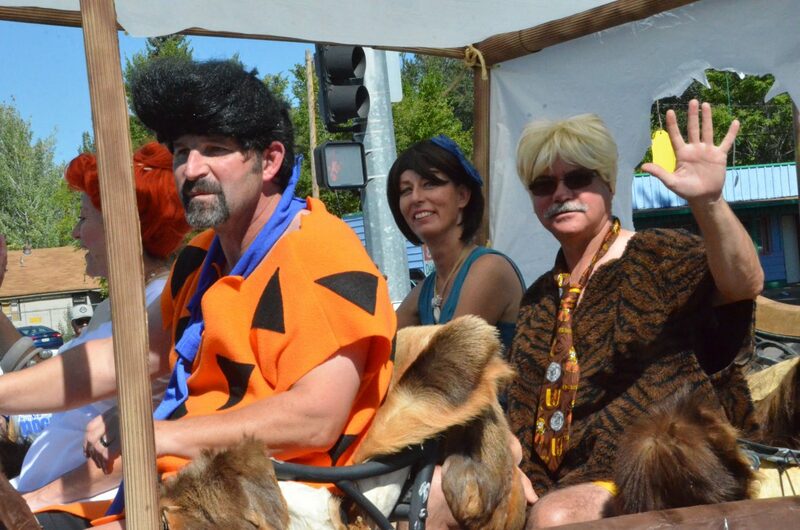 Members of Yampa Valley Bank portray the Flintstones and Rubbles during Friday's Moffat County High School Homecoming parade. 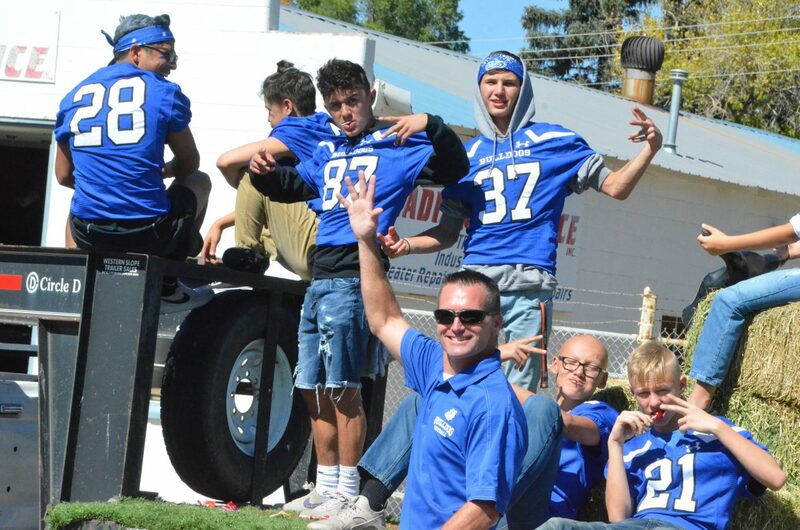 Moffat County High School football coaches and players greet spectators during the Homecoming parade Friday. 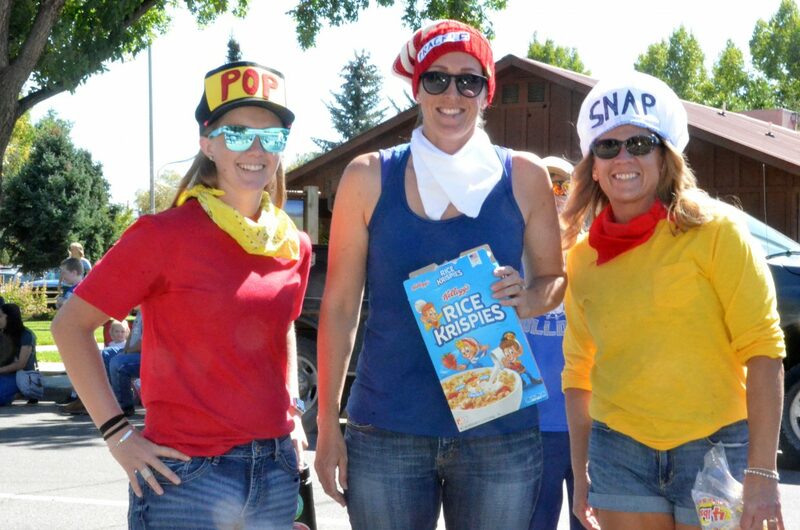 Moffat County High School volleyball coaches portray Rice Krispies' Snap, Crackle and Pop during the Homecoming parade Friday. 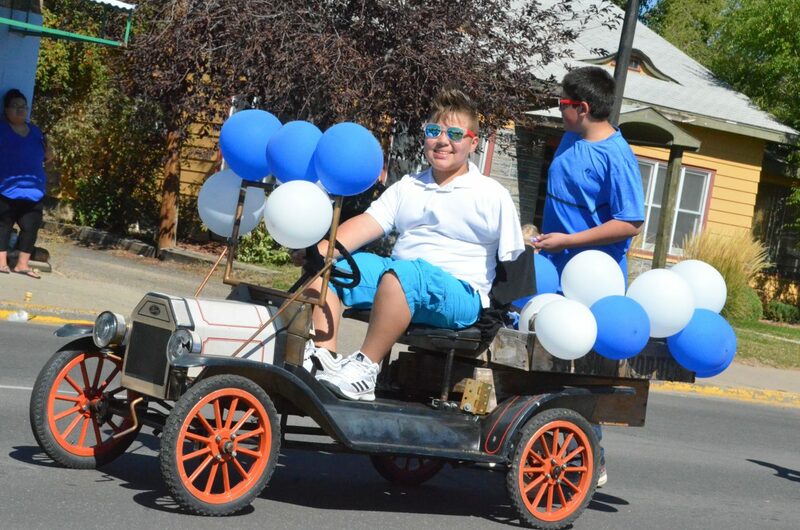 Vehicles of all sizes hit the road during Moffat County High School's Friday Homecoming parade. 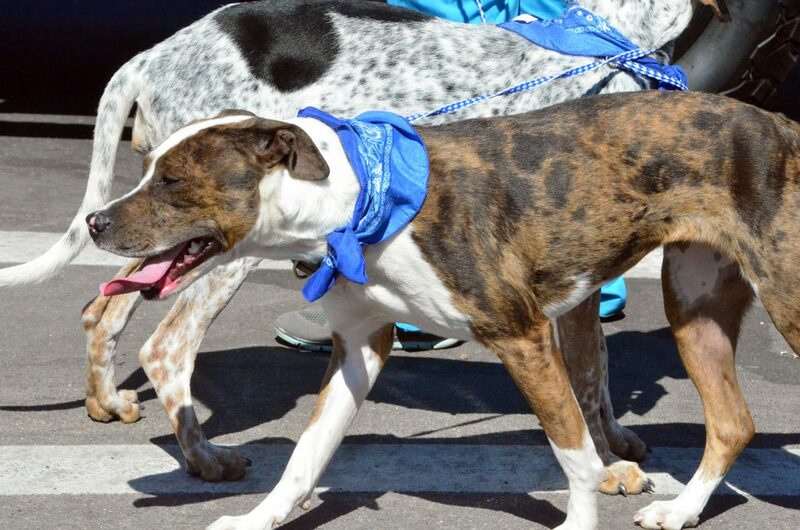 The Moffat County High School freshman class is joined by a four-legged companion during the Homecoming parade Friday. 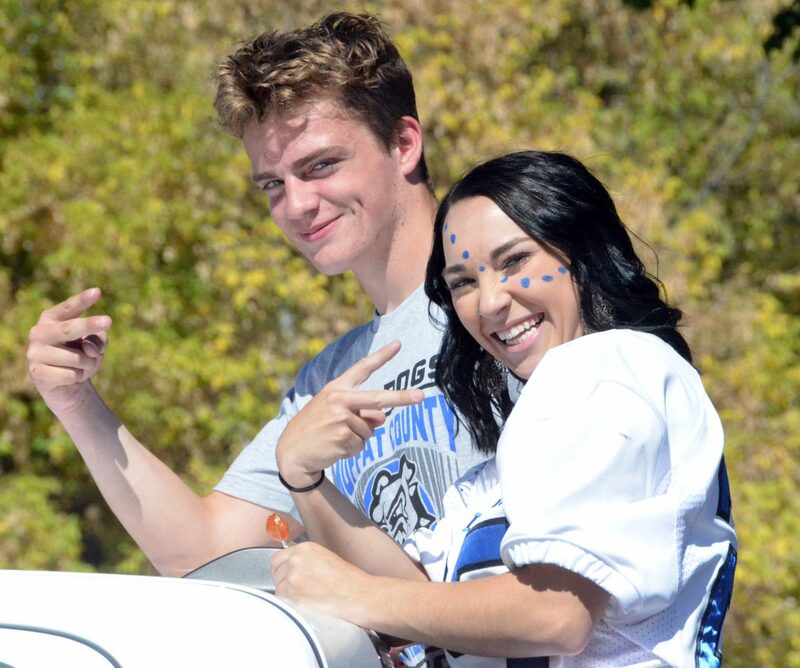 Moffat County High School's Blake Juergens and Emaleigh Papierski serve as the sophomore class attendants during the Homecoming parade Friday. 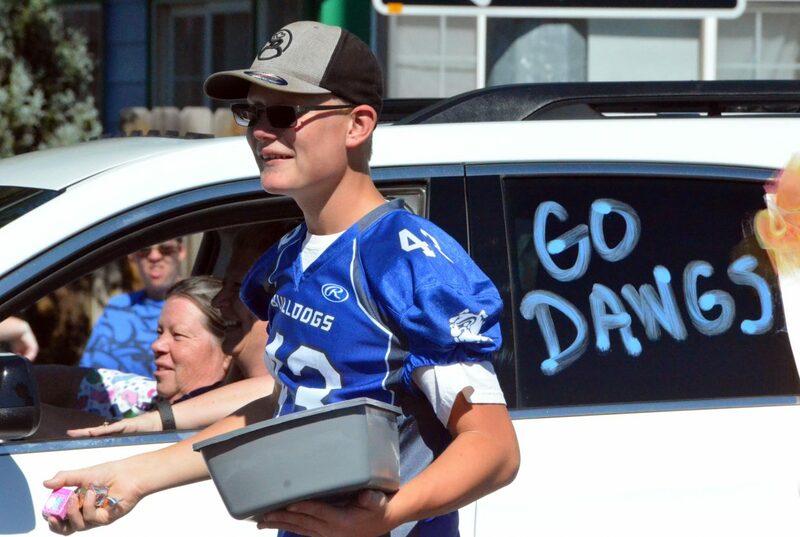 Craig Middle School's Matthew Cooper is one of many passing out free candy during Friday's Moffat County High School Homecoming parade. 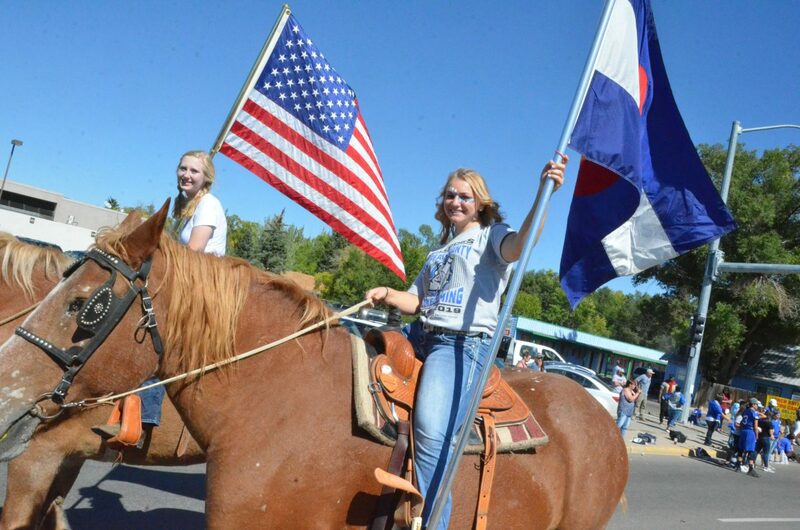 Moffat County High School FFA members Brianna Burkett and Alexis Blomquist carry the American and Colorado flags during Friday's Homecoming parade. 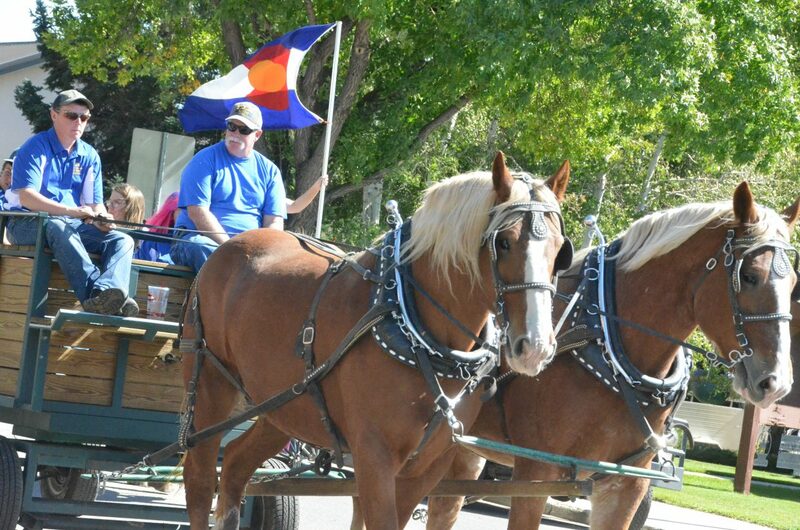 Moffat County High School FFA giddyap during the Homecoming parade Friday. 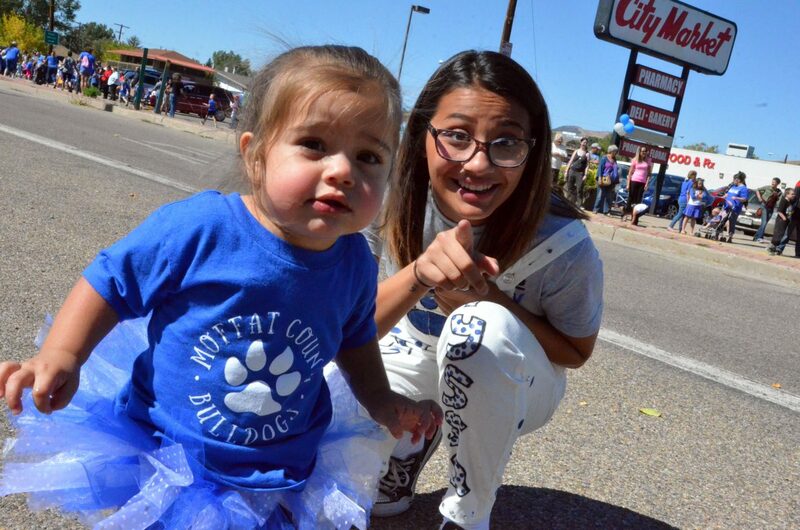 Moffat County High School's Alyssa Chavez attempts to get young football fan Teddi DiGrigoli's attention during Friday's Homecoming parade. 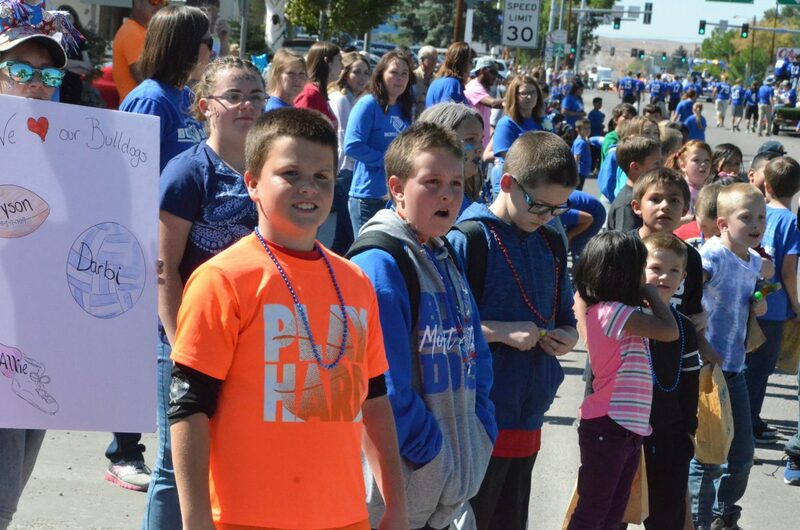 The crowd eagerly awaits the start of the Moffat County High School Homecoming parade Friday. 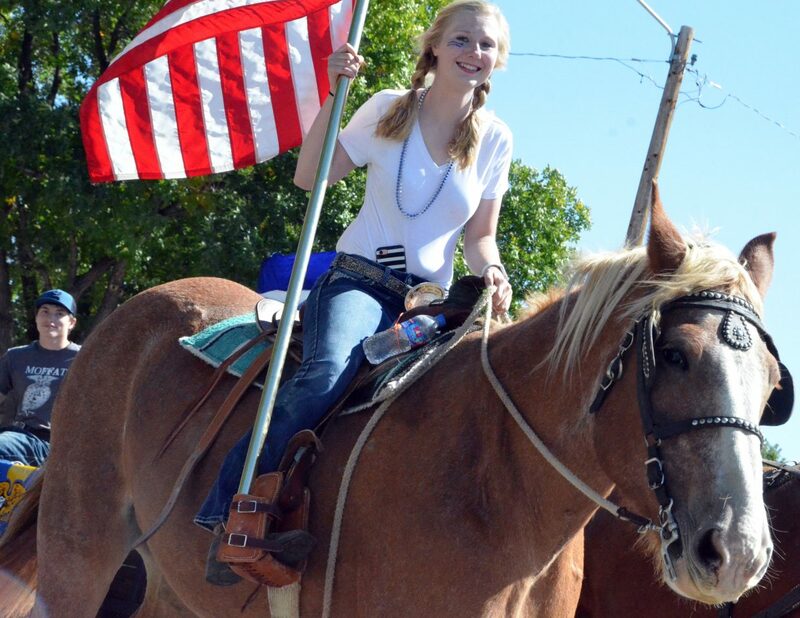 Moffat County High School's Brianna Burkett hoists the American flag on horseback during the Homecoming parade Friday. 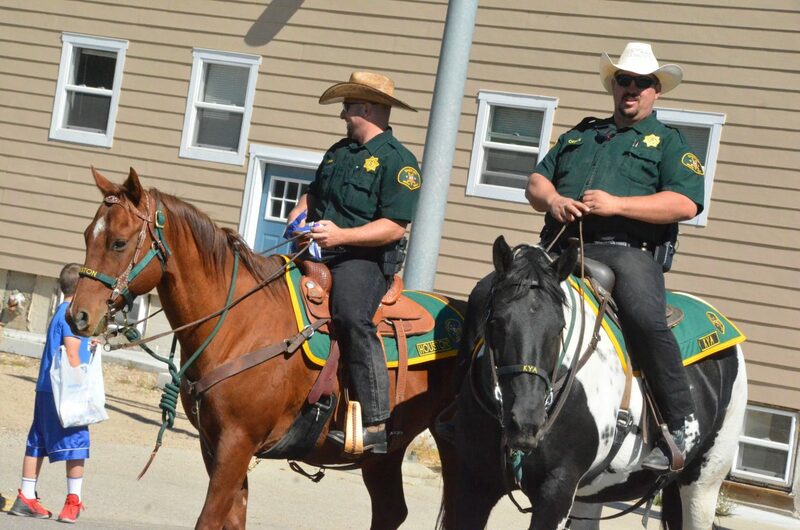 Mounted members of Moffat County Sheriff's Office bring up the rear to close Moffat County High School's Friday Homecoming parade. 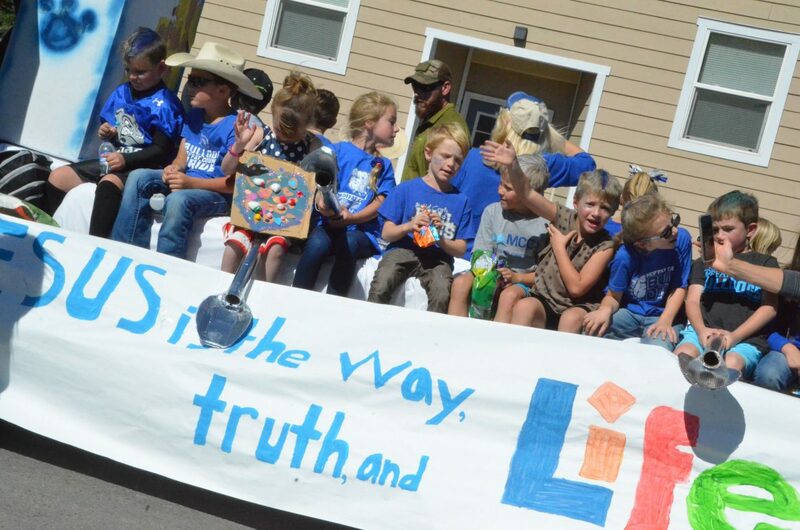 Moffat County Christian Academy's float is packed with students during Moffat County High School's Friday Homecoming parade. 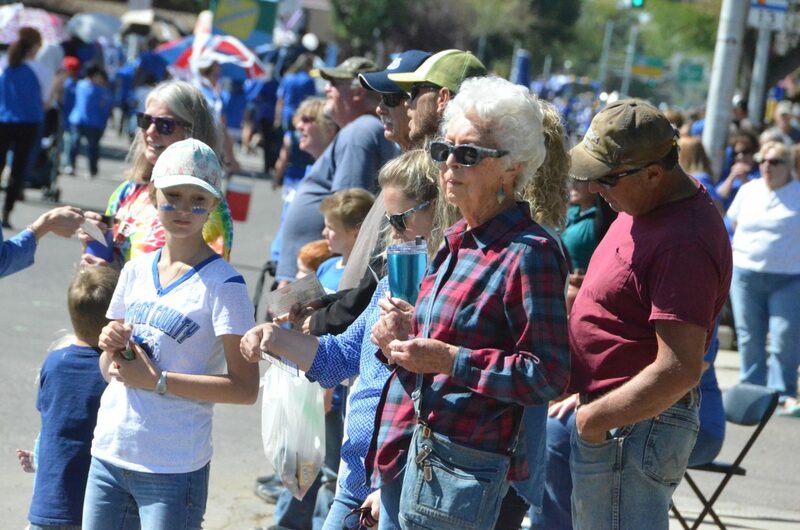 Crowd members observe the sights and sounds of the Moffat County High School Homecoming parade Friday. 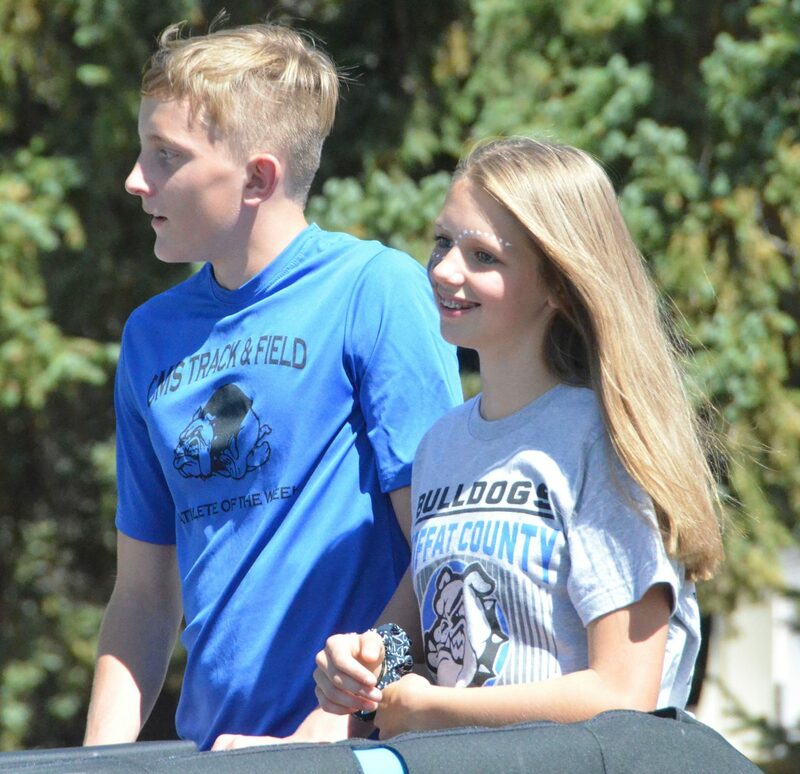 Moffat County High School's Logan Hafey and Emma Jones serve as the freshman class attendants during the Homecoming parade Friday. 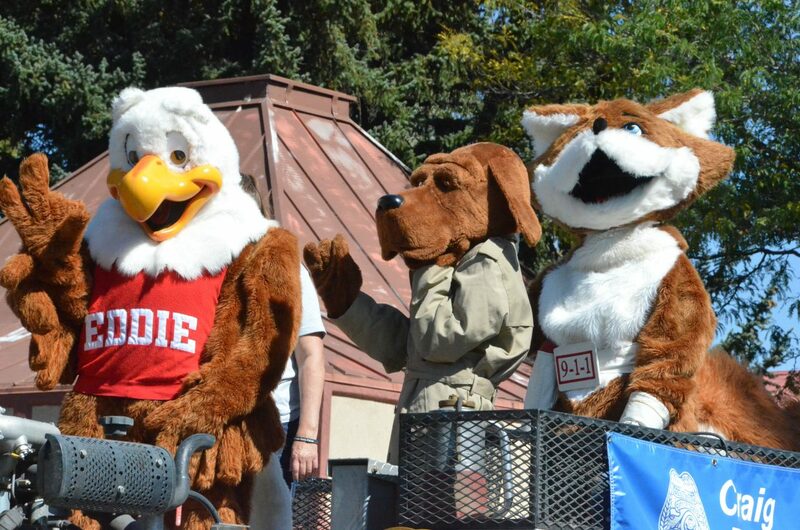 Safety mascots Eddie Eagle, McGruff the Crime Dog and Red E. Fox greet spectators during the Moffat County High School Homecoming parade Friday. 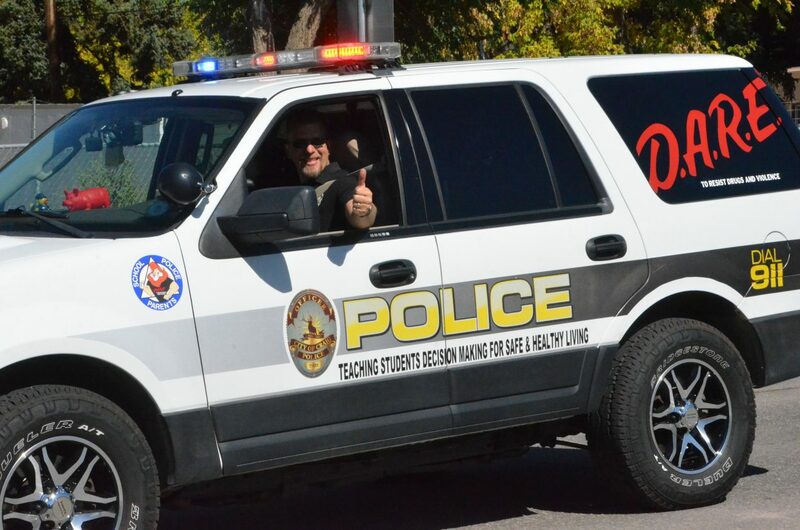 Craig Police Department's Ryan Fritz flashes a thumbs-up during the Moffat County High School Homecoming parade Friday. 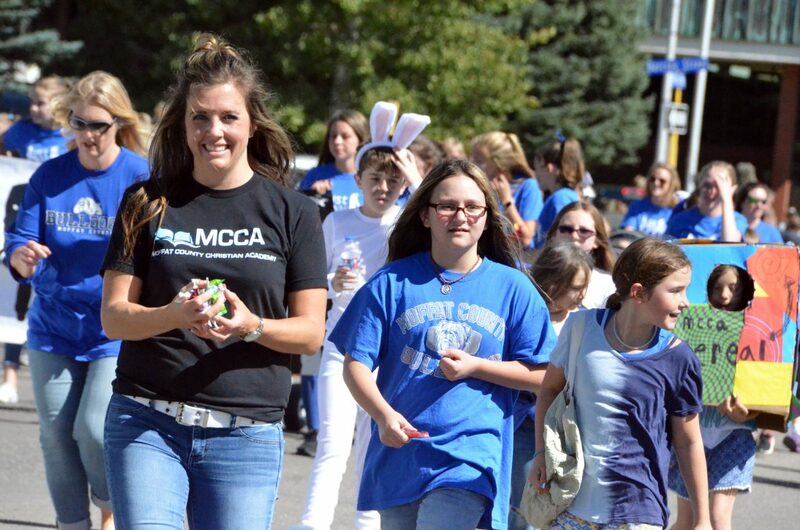 Members of Moffat County Christian Academy march along during Moffat County High School's Friday Homecoming parade. 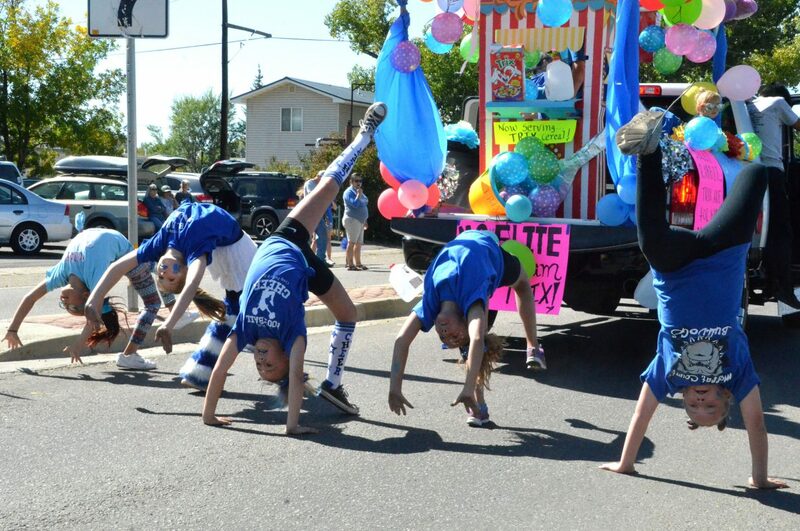 Members of Moffat County Elite Cheer perform back-handsprings during Moffat County High School's Friday Homecoming parade. 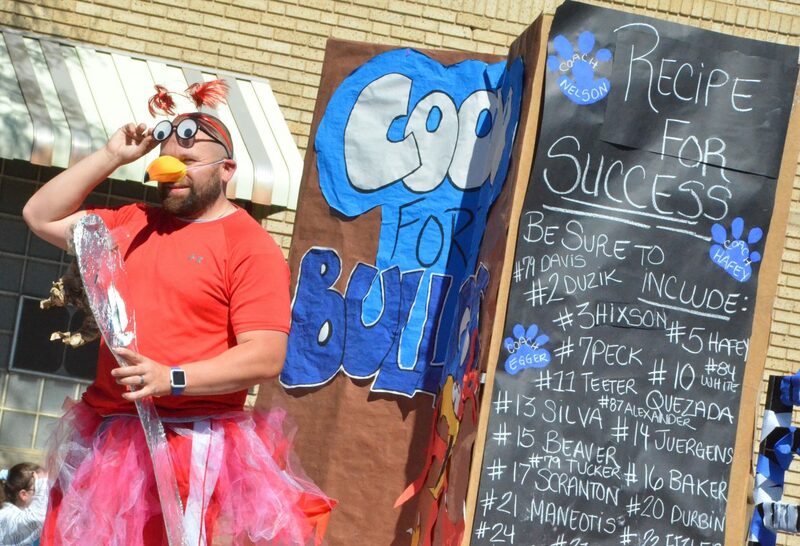 Sonny the Cocoa Puffs bird is cuckoo for Bulldog football during the Homecoming parade Friday. 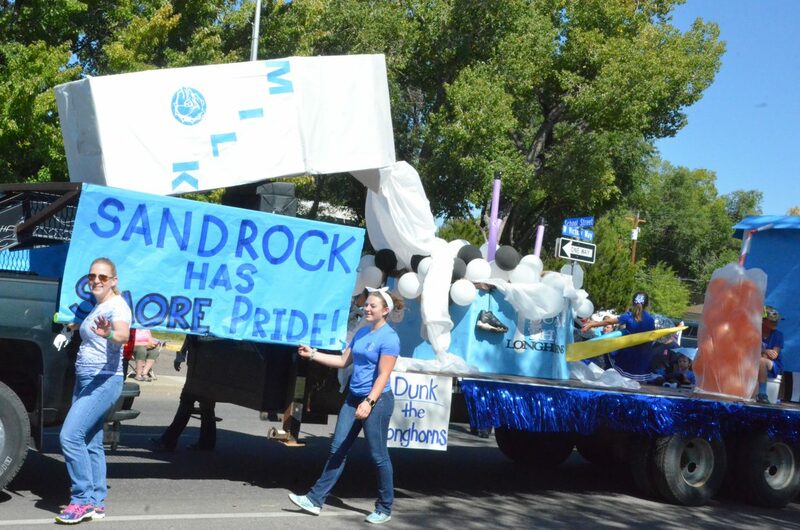 The Sandrock Elementary School float displays spilt milk in a cereal bowl during the Homecoming parade Friday. 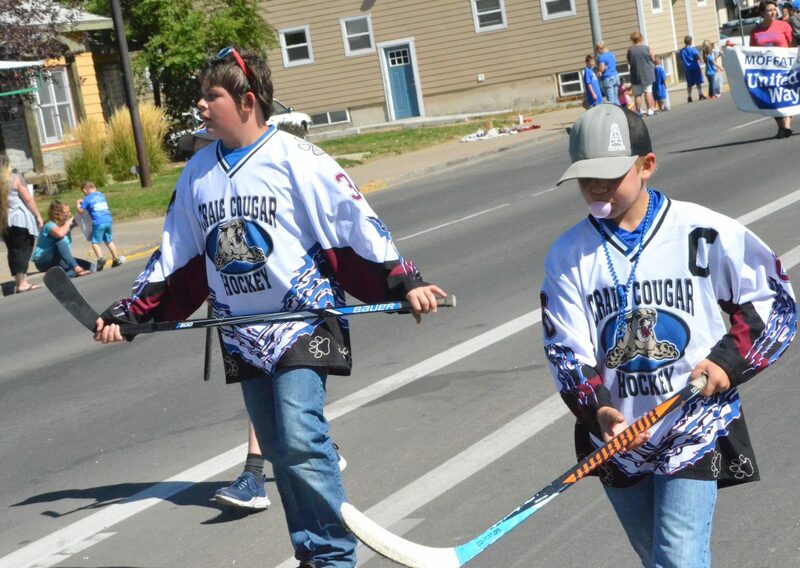 Athletes with Craig Youth Hockey Association march along during Moffat County High School's Friday Homecoming parade. 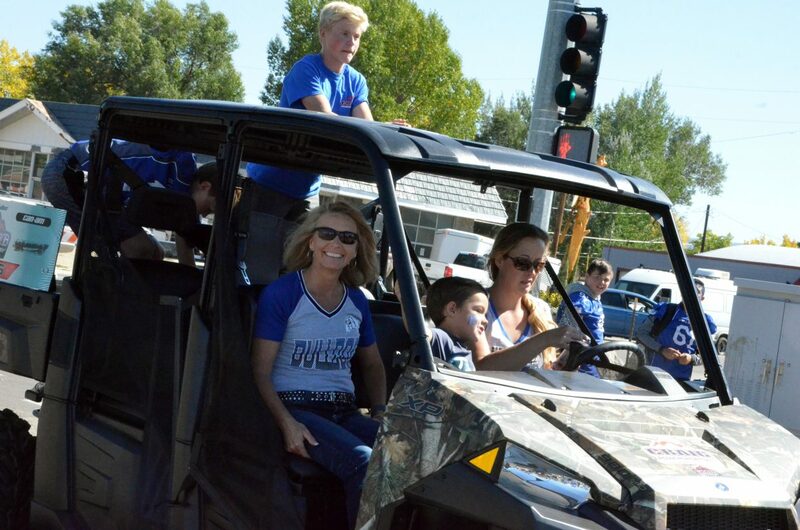 Bulldog pride speaks volumes during Moffat County High School's Friday Homecoming parade. 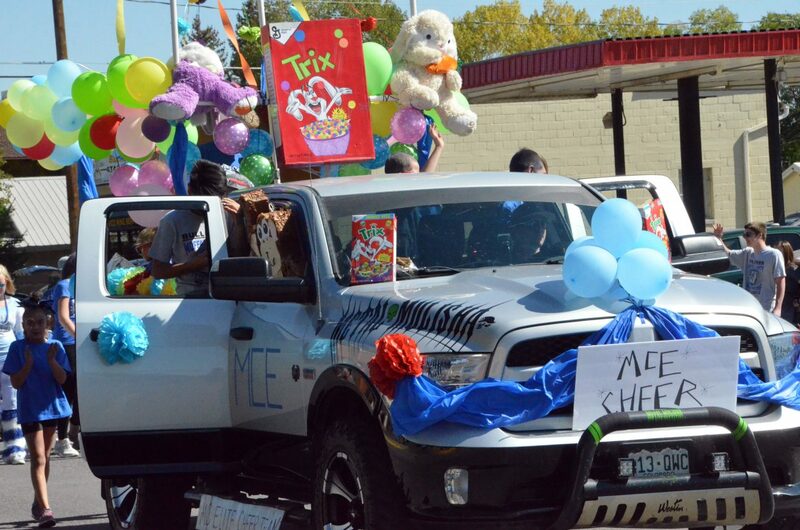 Moffat County Elite Cheer has a Trix theme during Moffat County High School's Friday Homecoming parade. 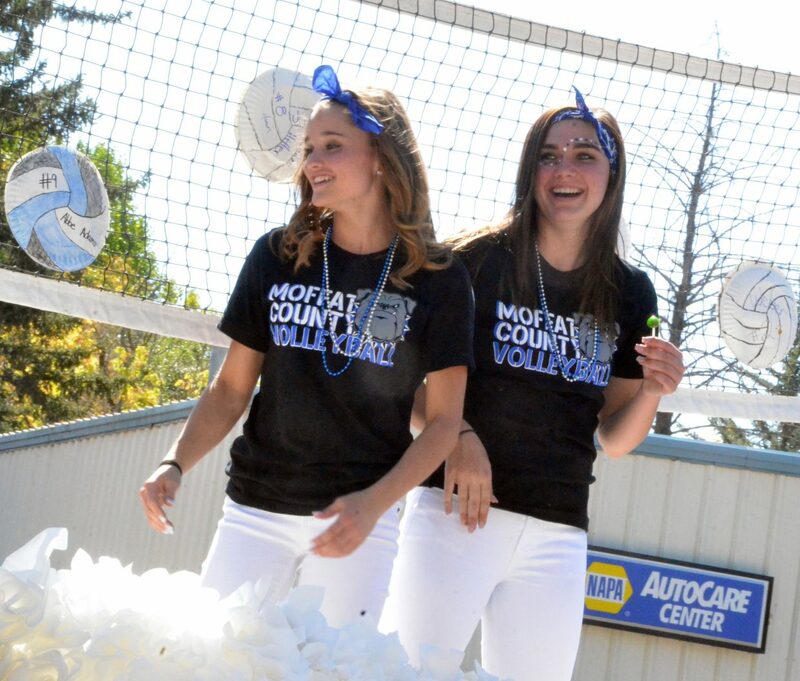 Bulldog volleyball players Stephenie Swindler and Jenna Timmer share a laugh on a float in the Moffat County High School Homecoming parade Friday. 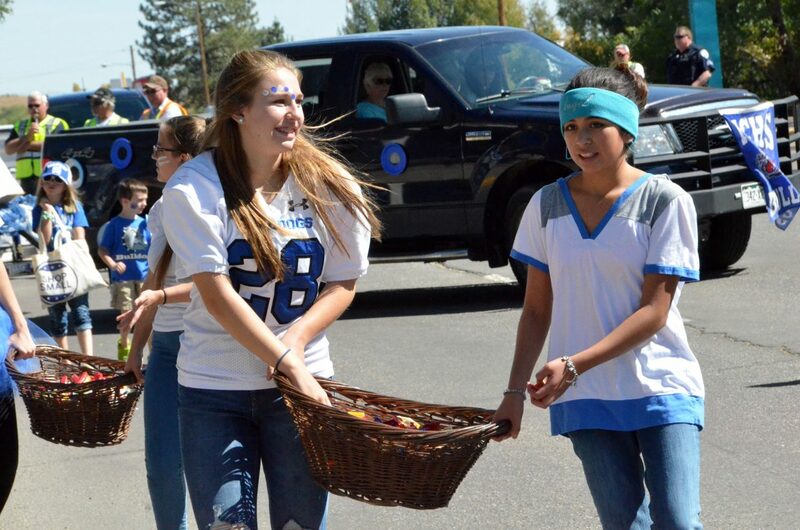 Moffat County High School students haul baskets of candy to hand out during the Homecoming parade Friday. 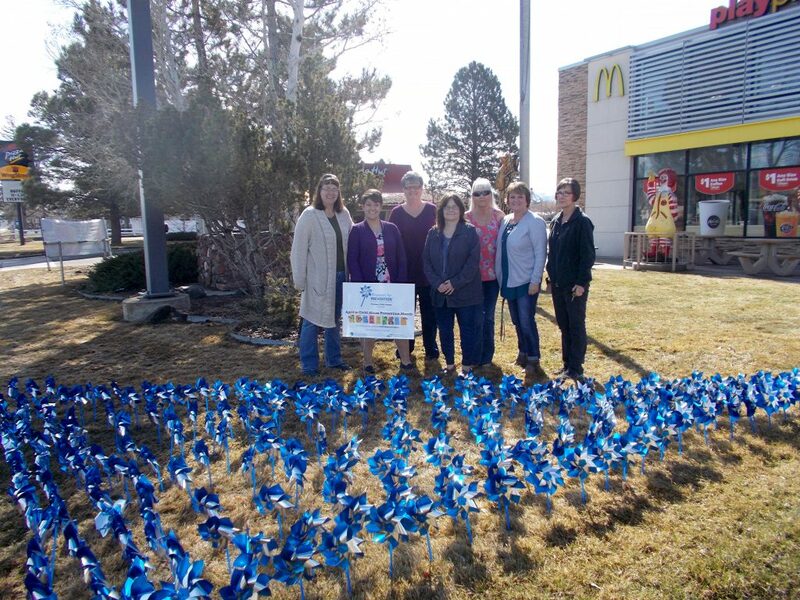 Spectators with Boys & Girls Club of Craig show their pride outside Bank of Colorado during Moffat County High School's Friday Homecoming parade. 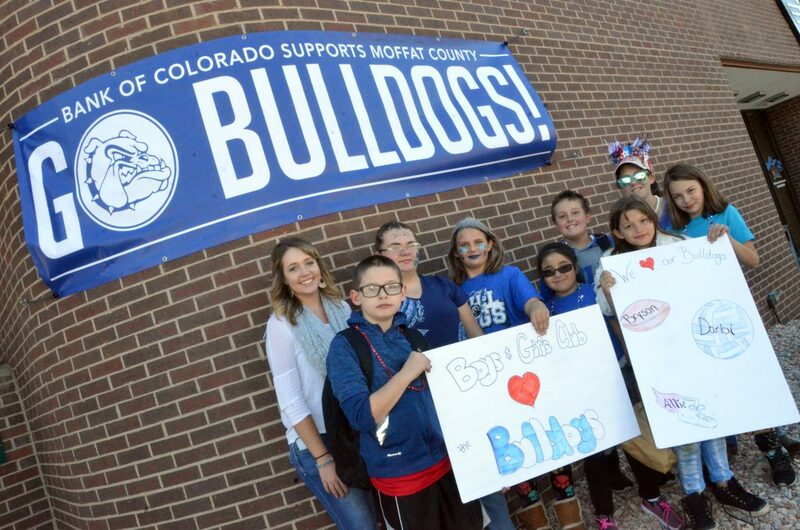 Craig Middle School students wear plenty of Bulldog blue and white during Moffat County High School's Friday Homecoming parade. 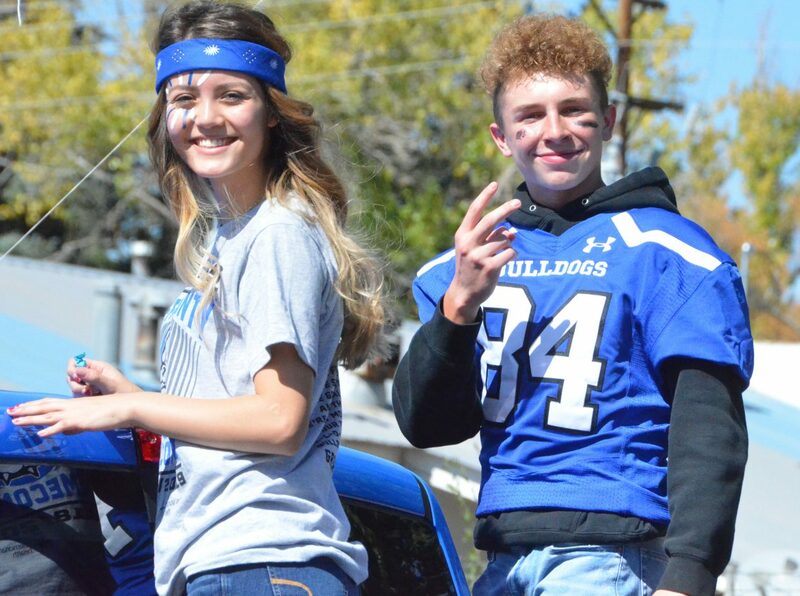 Moffat County High School's Marlyn Arellano and Dagan White serve as the junior class attendants during the Homecoming parade Friday. 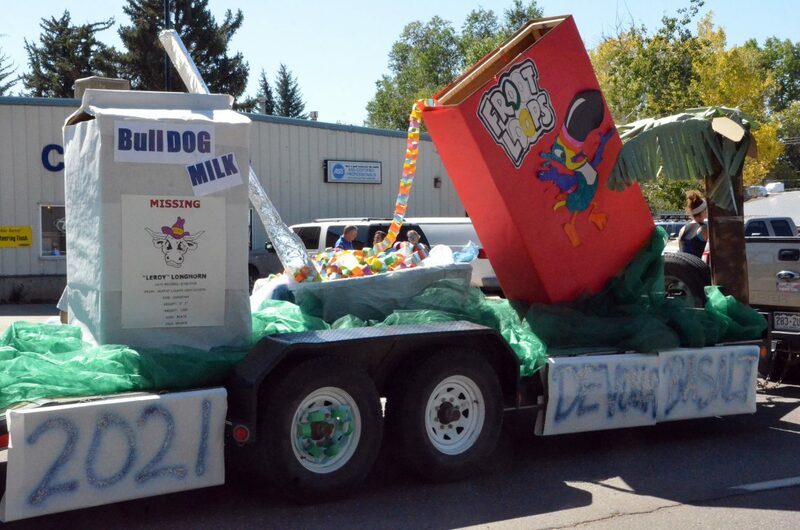 The Moffat County High School volleyball team's float is full of Bulldog pride during the Homecoming parade Friday. 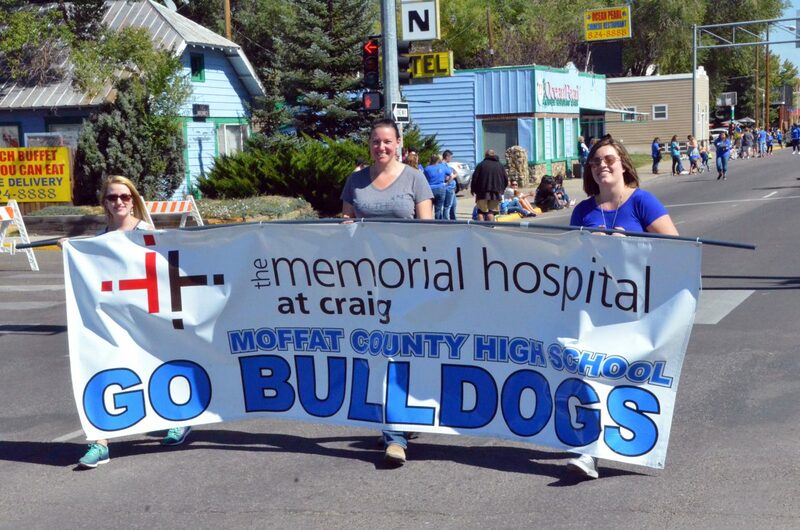 Members of Memorial Regional Health display their bulldog pride during Moffat County High School's Friday Homecoming parade. 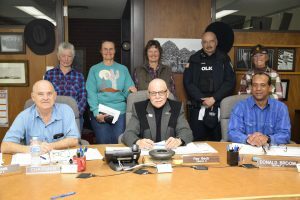 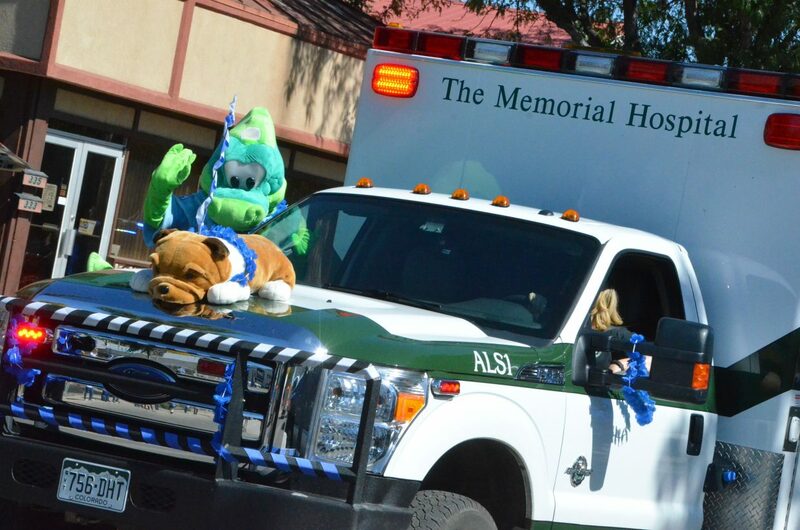 A Memorial Regional Health ambulance is among the vehicles to start off the Moffat County High School Homecoming parade Friday. 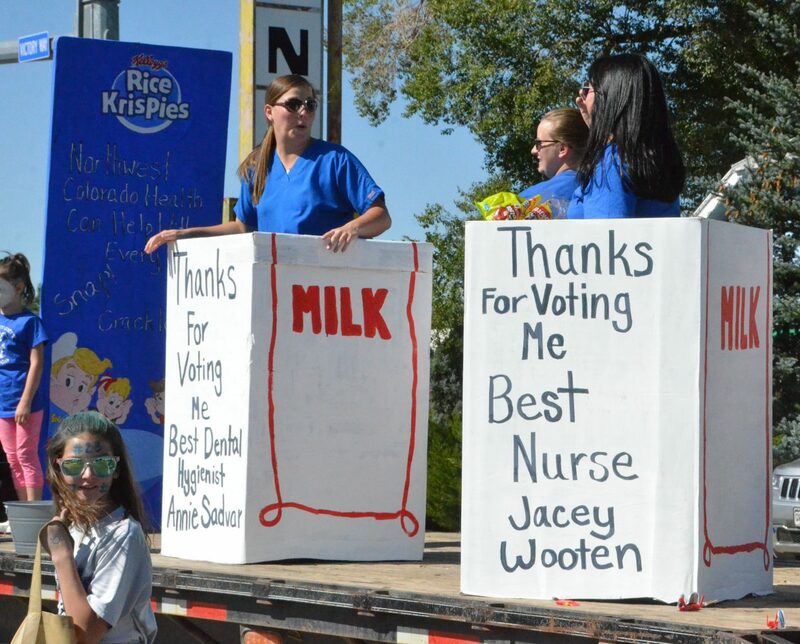 Members of Northwest Colorado Health are confined to milk cartons during Moffat County High School's Friday Homecoming parade. 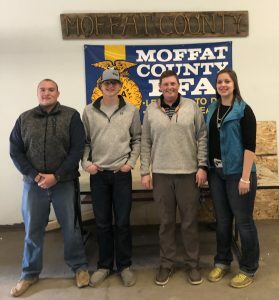 The Moffat County High School Homecoming parade hit Craig’s main thoroughfare Friday afternoon as Bulldogs young and old showed their pride. 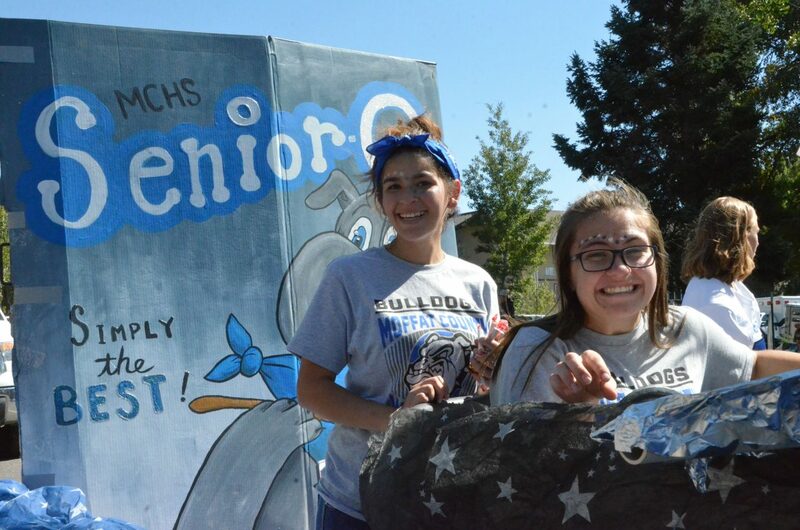 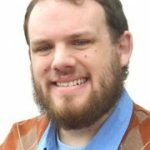 Students showed that breakfast isn’t just for first thing in the morning with the theme “A Spoonful of Homecoming” resulting in a supermarket aisle’s worth of cereal-centric floats and costumes, ranging from Wheaties to Frosted Flakes to Rice Krispies. 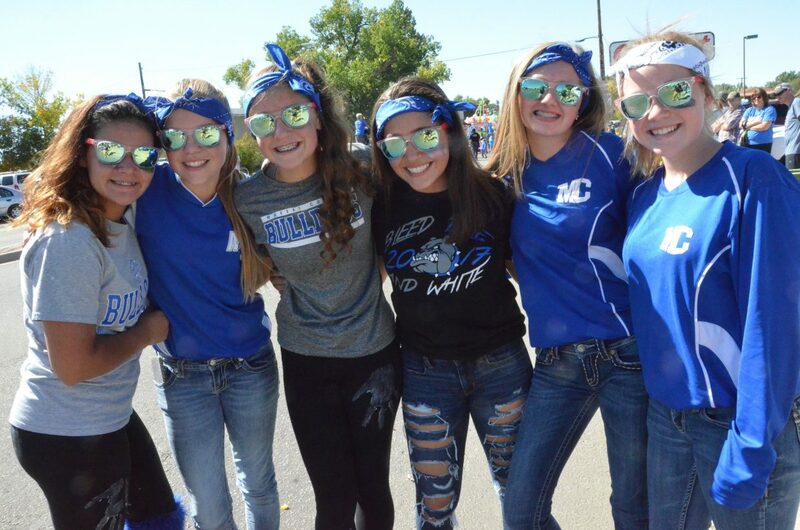 Also joining the fun were additional area schools at all levels, as well as law enforcement agencies, businesses and more as spectators turned out clad in blue and white to showcase their own innate Bulldog pride.